What is the difference between bear put spreads and bear call spreads, for example? Do you understand why they are each called by that name? This is all about getting our options trading terminology correct. The first word in the phrase indicates your view of the market. 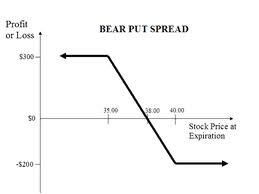 So a bear put spread would indicate that you believe the underlying stock in question is about to take a price dive. In other words, you're bearish on the stock, so your vertical spread strategy will reflect that. The next part of the expression indicates not only the type of spread you are going to do, but when combined with the bearish nature of your view of the stock, the fact that it will be a debit spread (not a credit spread). If you were doing a credit spread, you would want the underlying to remain away from the spread strike prices until option expiry date for it to be profitable. But for a debit spread you would ideally like it to plunge through both strike prices for maximum profit. Bear put spreads are option debit spreads that are structured by buying put options with a strike (exercise) price that is close to the current market price of the share ... and simultaneously selling the same number of put options at an exercise price that is lower than the bought options. Since the bought options will be more expensive (being closer to the money) than the sold ones, the net result is a debit to your brokerage account - hence, the "debit spread" part of the trade. Since we enter put debit spreads because we believe we can make significant gain if the underlying price falls, they provide a way of entering a greater number of option positions at less cost than simply buying (going long) puts. They also allow greater flexibility should the underlying price temporarily go against us, in that we can consider buying back the 'sold' position for a fraction of what we sold it, in the hope that should the stock resume its downward trend, we will profit from the remaining bought put option, which we now own at a tremendous discount. Your maximum profit on these debit spreads will be the difference between the strike prices at expiration date, less the net premium (debit) you paid to enter the spread. For this to occur, the price action of the underlying will need to be at, or below, the strike price of the further out-of-the-money sold option. You can of course, take a lesser profit at any time up to the time the options expire. This strategy should be distinguished from the bear call spread. The latter are credit spreads, again the result of a bearish view of the market but comprised of call options in the hope that the underlying stock will remain away from their strike prices. More about that at another page.